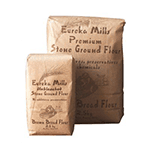 Eureka brown bread flour is unbleached bread flour with a percentage of bran added. It is produced by means of slow stone mill grinding from sustainably grown wheat crops. Suitable for all yeasted baked goods such as bread, pizza etc. Work equally well for bread machines and hand-made recipes.